The USGS generates a real-time map of earthquakes that have occurred recently in the United States. The map can be customized to include earthquakes of any strength and magnitude that have occured within the past 30 days. This map is updated hourly and can be viewed by selecting the “Map” option from the menu at the top of the linked page. Boston College’s Weston Observatory generates a real-time map of earthquakes that have occurred in New England. This map is updated regularly. The USGS “Did You Feel It?” page used public surveys to track the extent and damage of recorded Earthquakes. These surveys are updated as new survey data comes in. Boston College’s Weston Observatory is an earthquake research station that monitors Northeast. 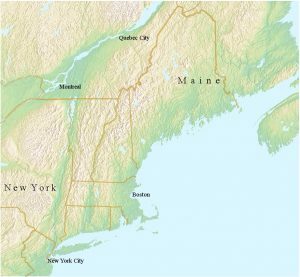 Their site contains many earthquake links, including a list of recent earthquakes in New England.